The fact that the USA is trying to gain dominance in all possible spheres in the world is no longer news. However the main field of confrontation and challenge between the USA and other countries remains the sphere of armed forces where the USA continues to invent new ways and methods of gaining the dominance. The following is another American trick to consolidate its positions. The Pentagon is pressing Congress to approve the development of a new weapon that would enable the United States to carry out nonnuclear missile strikes against distant targets within an hour. The proposal has set off a complex debate about whether this program for strengthening the military's conventional capacity could increase the risks of accidental nuclear confrontation. The Pentagon plan calls for deploying a new nonnuclear warhead atop the submarine-launched Trident II missile that could be used to attack terrorist camps, enemy missile sites, suspected caches of biological, chemical or nuclear weapons and other potentially urgent threats, military officials say. If fielded, it would be the only nonnuclear weapon designed for rapid strikes against targets thousands of miles away and would add to the United States' options when considering a pre-emptive attack. Gen. James E. Cartwright, the chief of the United States Strategic Command, said the system would enhance the Pentagon's ability to "pre-empt conventionally" and precisely while limiting the "collateral damage." The program would cost an estimated half a billion dollars over five years, and the Pentagon is seeking $127 million in its current spending request to Congress to begin work. But the plan has run into resistance from lawmakers who are concerned that it may increase the risk of an accidental nuclear confrontation. The Trident II missile that would be used for the attacks is a system that has long been equipped with a nuclear payload. Indeed, both nonnuclear and nuclear-tipped variants of the Trident II missile would be loaded on the same submarines under the Pentagon plan. Reflecting the worry that Russia and other nations might misinterpret the launch of a nonnuclear Trident as the opening salvo in a nuclear barrage, lawmakers have insisted that the Bush administration present a plan to minimize that risk before the new weapon is manufactured and deployed. 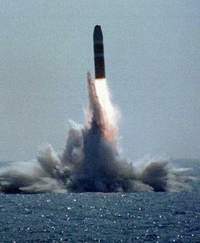 The program to develop a conventional version of the Trident II missile was foreshadowed in the Nuclear Posture Review, a classified study the Pentagon carried out in 2001. The study urged that nonnuclear systems be added to the existing triad of long-range nuclear air, land and sea forces — a concept that the military nicknamed "Global Strike." The Strategic Command, which oversees the long-range nuclear weapons in the United States arsenal, was given the responsibility to figure out a way to develop such a capability. In 2004, General Cartwright, a Marine officer, was appointed to head the command. In looking for a new weapon, General Cartwright said, his goal was a nonnuclear system that could respond to a threat in no more than an hour, including the time that would be needed to secure the president's authorization to attack. Neither bombers nor cruise missiles met General Cartwright's requirement because he reasoned that the threat might emerge in a region where the United States lacked bases or had few or no forces. It can take days for the United States to move aircraft and ships into a crisis zone and position them to strike. Bombers can attack remote targets from the United States or bases abroad, but it takes many hours to conduct such a mission. So the Strategic Command developed a plan to fit conventional warheads on existing Trident II ballistic missiles. Defense Secretary Donald H. Rumsfeld has wholeheartedly supported the idea, and the Pentagon wants to field the system in two years. In justifying the program to lawmakers, General Cartwright outlined a number of potential situations. "The argument for doing it is that there are instances, fairly rare, when time is so critical that if you can't strike in an hour or so you are going to miss that opportunity," said Representative Roscoe G. Bartlett, the Maryland Republican who is chairman of the House Armed Services Subcommittee on Projection Forces and who is still weighing whether to support the plan. One possible situation, Mr. Bartlett said, would be "people putting together some terrorist weapon, and while they are putting it together we can take it out, and if we miss that opportunity it may show up on the streets of New York City or Washington, D.C."
Still another might involve the need to destroy an enemy missile equipped with a chemical, biological or nuclear warhead before an adversary can launch it at the United States or its allies. Another would be fresh intelligence about a meeting of terrorists. Given the considerable American military presence in Iraq, Afghanistan and South Korea, some critics say the circumstances in which a target may be beyond the reach of American warplanes or armed Predator drones are few indeed. Acquiring the sort of precise intelligence that would give the president enough confidence to order the launch of a ballistic missile within an hour might also be a daunting proposition. General Cartwright said that the weapon would give the president an option to respond quickly to the sort of immediate dangers that are most likely to become more common in the 21st century without taking the drastic step of resorting to a nuclear-armed ballistic missile. A major issue, however, is whether the Pentagon will prepare for new threats at the risk of aggravating old nuclear risks. Under the Pentagon plan, each Trident submarine would carry two of the nonnuclear Trident II missiles along with 22 nuclear-armed Trident missiles. Each of the nonnuclear missiles would carry four nonexplosive warheads. Two types of warheads would be developed. One type would be a metal slug that would land with such tremendous force it could smash a building. The other type of warhead would be a flechette bomb, which would disperse tungsten rods to destroy vehicles and less well-protected targets over a broader area. As currently configured, the weapon would not have the capability to destroy facilities that are buried deeply underground. The system would use satellite tracking to improve its accuracy. General Cartwright asserted that a test demonstrated that a nonnuclear version of the missile could fly thousands of miles and deliver its payload just five yards away from its target. Two former defense secretaries, James R. Schlesinger and Howard Brown, weighed in with an op-ed article last week in The Washington Post, urging the Congress to support the system. The worry about Russia centers on whether that country could distinguish the launch of a Trident II from a nuclear strike, especially since its early warning network has deteriorated since the collapse of the Soviet Union. There is also some concern about China, which has a meager capability to detect incoming ballistic missiles.